Bri and I have decided that in the spring we'll buy the biggest house we can afford. Rates are going to be back to all time lows (5s or under). Locking a 30 year mortgage on a big house before inflation kicks in will mean our future payment streams will just get smaller over time. I will also be buying several assault rifles and shotguns, to defend us from the zombie hordes that are sure to overrun all civil and federal governments in the next fifteen years. Or from the governments. Whatever. My big question is, do we go with electrical fencing and barbwire or a bunch of snarling rottweilers to secure the perimeter? And, underground bomb shelter to wait out the apocalypse, or a helicopter for quick entry and exits? This is what I sit around worrying about. I went for a pleasant run this morning. Took the neighborhood route to Inside Out, which was a 2.5 mile warm up, then ran the Turkey Trot 8k with 800 of my closest friends. My turnover/stride rate is not great right now but I did a respectable 33:15. Will do some work today and then celebrate Thanksgiving with Bri, my sis in law Shana, her boyfriend Scott, and a couple other friends. Happy T day to you all. I'm in the process of adding titles, text, and other stuff to the lecture portion of our DVD. It actually looks fairly professional, for which I credit the nearly dummy proof Mac software interfaces. Timelines, layers, and other cool stuff are moderately intuitive. The movie is not going to be quite as high tech as Spider-Man, for example, but I won't be embarrassed to ask someone to pay for it. In other news, Bri and I had a really nice and relaxing weekend here at home. We did a run on Saturday (I ran, she fought the dogs) and quiet dinner/movie, then a ride through Umstead and our local trails on Sunday, followed by lazing around the house. Tassie has been very tired today, and slept through most of it. I will be running in the Inside Out Turkey Trot 8k on Thursday. Congrats to first time IMers Jen Davis and Amy Kramer, who both did well at Ironman Arizona. 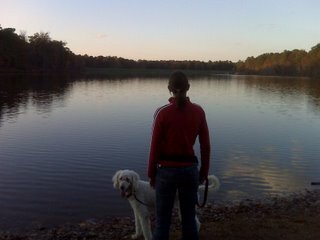 Here is a nice picture of Bri and Tassie I took on one of our walks around our local Bond Park. On that note, you can check out the new Powerstroke DVD website here. - don't call Bri every half hour and say "The market is up! The market is down!" This will go down in my personal history as the year of did not starts (DNS). There are a bunch of them. IM Arizona in April. Mission Man in July. Survival of the Shawangunks in September. Philadelphia Marathon in November. Makes you wonder, what is going on in Marty-world? What can I say. I just didn't care that much this year. A combination of demotivation and a decided lack of perseverance on the personal athletic homefront regarding endurance events. I signed up for all of these with good intentions, but sometimes things don't work out the way you plan. Since Bri can't run, my lust to drive to Philly and run a marathon has petered out. I'm actually training pretty well and getting fit. Running 5-6x. Swimming 3-4x a week. Kungfu-ing it up. Will even be getting back onto the bike shortly. Just a non-competitive season for me personally. I have been living vicariously through my athlete's exploits (they have done well and that really is pretty rewarding). Next year will be good. We also have some events in the pipeline that I am going to be psyched to announce. Need to work out a few kinks before making them public. Next week Master Chen wants me and Dave to test out of Bronze Eagle and start in with the Silver Eagle class. Did you ever see the episode of Seinfeld where Kramer is the best in his karate class? That is us right now. Two 30+ year olds vs five eight year olds. In other news, the stock market tanked today. Auto industries need to go into bankruptcy and re-org. $78 / hour union workers. 'Nuff said. We're going to head to downtown Raleigh today for the Old Reliable 10k. It's a 2 o'clock run. Pleasant and cool outside, so it'll be a good day for a run. I'll give it a decent effort but my leg speed is not all that terrific right now. I have been working on the swim DVD and plans for 2009 the past few days. In other news, I've been doing some homework on Jim Rogers and the Rogers Agricultural commodities index. (RJA). It is an exchange traded note which tracks 20 commodities like wool, corn, soybeans. Check it out. We had a nice weekend here. On Friday my Dad and I went fishing for striper bass on Jordan Lake. We didn't catch a thing but it was a gorgeous day and we had a great time. On Saturday we bummed around a bit and then held a poker game here at the house. I lost. But that's how it goes. On Sunday Bri and I were going to head out for a long run in Umstead, but her calf was bothering her. So instead we went home, grabbed Tassie, and took her for a nice walk around Bond Park. The leaves are changing color and it was a nice time. Then we had dinner at our friend Dan's house. Very busy weekend. The Philly marathon is coming up in just a couple weeks. I am overweight and undertrained, but plan to finish without any drama. Afternoon update: Due to my general indifference and Bri's current calf/achilles issues, we may bag the seven hour drive to Philly. If that's the case I'll run in the Thunderbolt Marathon over in Charlotte on 12/13. This weekend I am doing the Old Reliable 10k. With a run to downtown that'll be 16 miles or so. I am the party guilty of placing advertisement on Bri's blog. My website has been getting a couple clicks a month, which adds up to free dollars over time. So while we can't actively encourage you to click on the ads, if you see something you're interested in, feel free to check it out. This weekend my Dad is coming into town. Tomorrow we're going fishing for striper bass in Jordan Lake. On Saturday we're either going to play some poker here in town or head down to Myrtle Beach to go out on a gambling boat. I am still taking wushu / kung fu, it is a great physical workout. In a couple of months I will need to be able to do an aerial, which is a cartwheel without putting your hands down. I have never had much of a vertical leap so this is going to take some practice. The last two days here in NC have been cold and rainy. But this morning Bri was a trooper and dragged me out of bed for a 55 minute run with 4 x 5 minute tempo in the middle. It takes me a while to get moving in the morning. I voted a split ticket today. The toughest choice was either Kay Hagan (D) or Elizabeth Dole (R) for Senate. I voted for Dole since a) she did vote against the bailout and b) a filibuster proof Democratic majority in the Senate with a Democratic President is not something I lie awake dreaming about. I also picked a couple Libertarians for good measure. We are safely back home here in Cary. It was a good day on Saturday. We watched everyone compete in Ironman Florida. Bri's athletes both did well and my athlete (all first timers) also beat his goal time. Everyone was happy. I opted to sleep in on Saturday morning and skip the swim start, then rock and rolled the rest of the day. Driving down and back was a bit of a chore, but other than that we had a lot of fun. I listened to Howard Stern, Sirius Patriot or Bloomberg radio for most of my driving shifts. Sirius Patriot is a conservative leaning station with the likes of Mike Church, Andrew Wilcow, and Sean Hannity. They are basically more entertaining than the hippies and stoners that you get on Sirius Left. I occasionally listen to them, but the dialogue tends to be slow moving and the callers are all peaceful and placid, like surfers on valium. Angry conservatives make for better talk radio. Bloomberg news is just waaay exciting. Korean stock talk. You can't get any better. We ran 1 hour 45 minutes on Saturday during the race. I ate a lot of junk food.